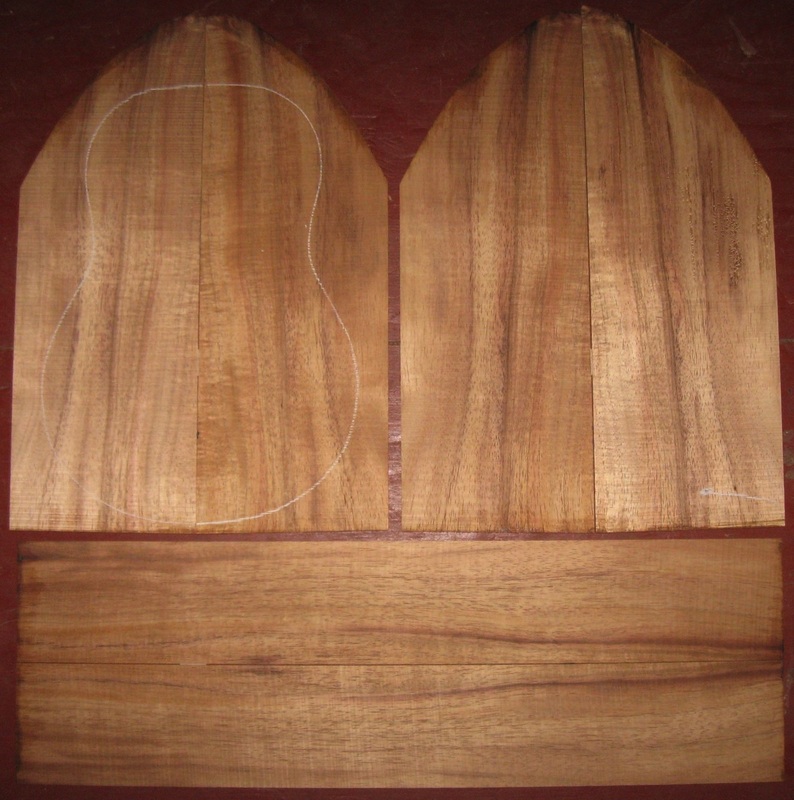 (1) top-back plate 7-3/8" x 21-1/4"
(2) side plates 2-1/2" x 15"
Air dried since 2006, honey-brown; one-piece top and back. (4) top-back plates 4" x 11"
Air dried since 2006, honey-brown, strong fiddleback, flat-rift sawn. 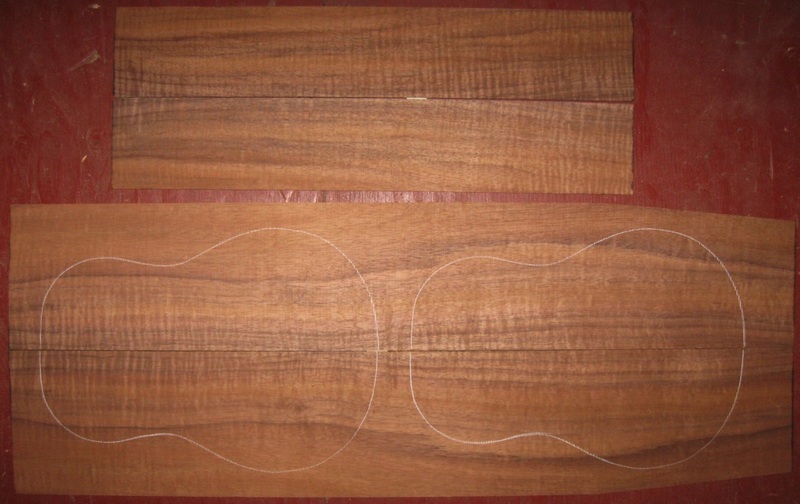 (4) top-back plates 5-1/4" x 13-1/2"
(2) side plates 3-1/4" x 19-3/4"
Air dried since 2015, creamy color and striping, tight knot in sides (circled. 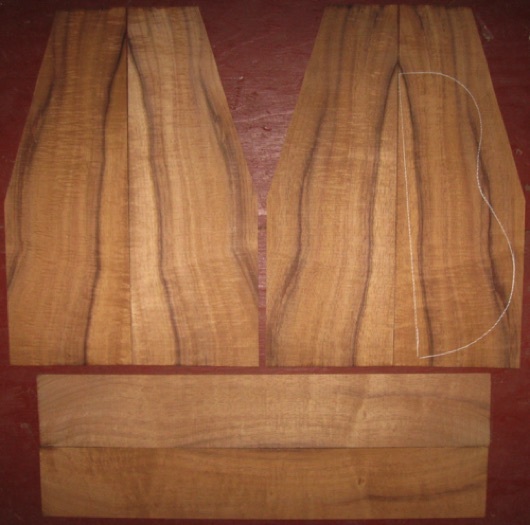 (4) top-back plates 5-1/4" x 14"
(2) side plates 3-1/4" x 20-1/2"
Air dried since 2013, good color and striping, straight grain. 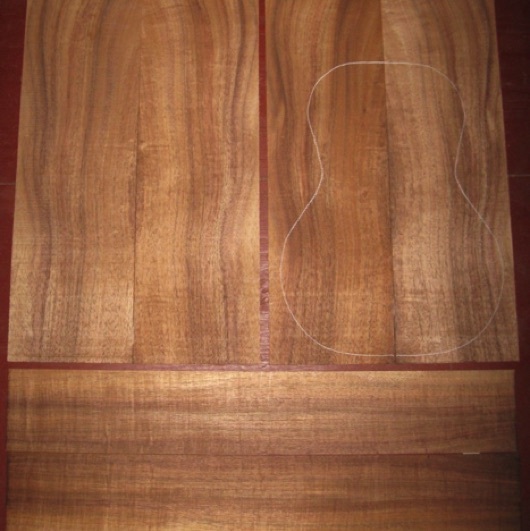 (4) top-back plates 5-1/8" x 14-1/2"
Air dried since 1996, tenor pattern shown, light curl, bright honey-brown color. 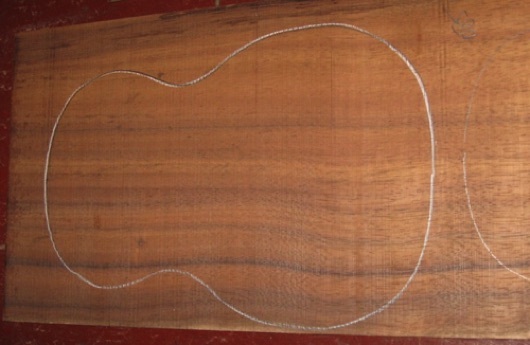 Tiny pinhole on one top plate can be placed outside pattern area, no problem. 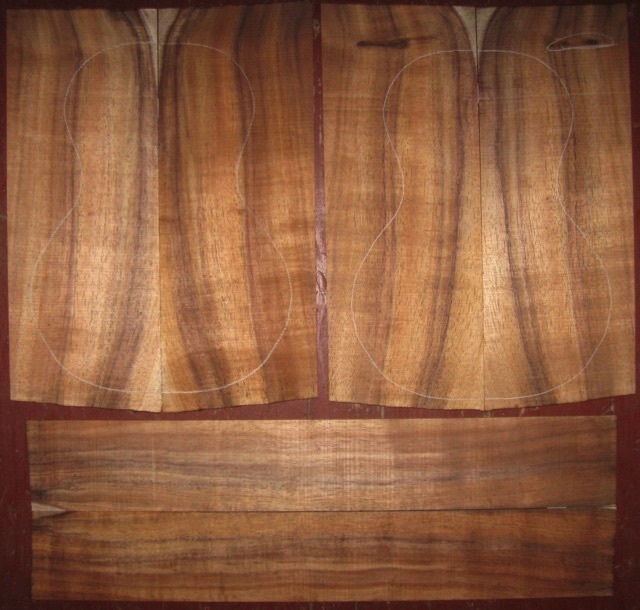 (4) top-back plates 5-1/4" x 1/4"
(2) side plates 3-1/4" x 18-1/2"
Air dried since 2016, tenor pattern shown, light curl, bright orange-brown. 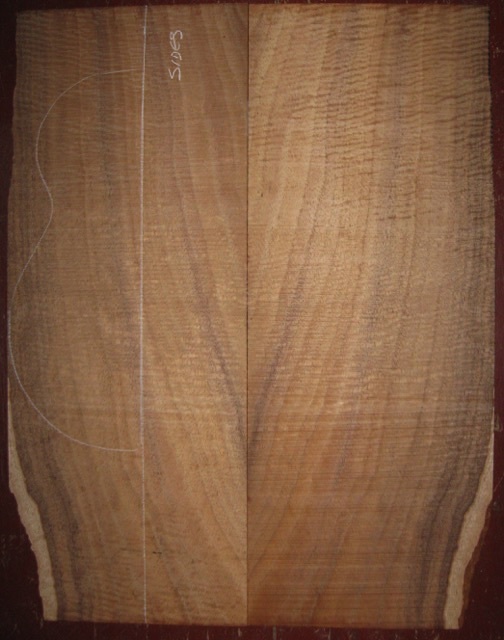 (2) plates 6-15/16" (tapering) x 17-7/8"
Air dried since 2006, amazing fiddleback curl, big enough for concert back and sides (verify your dimensions). 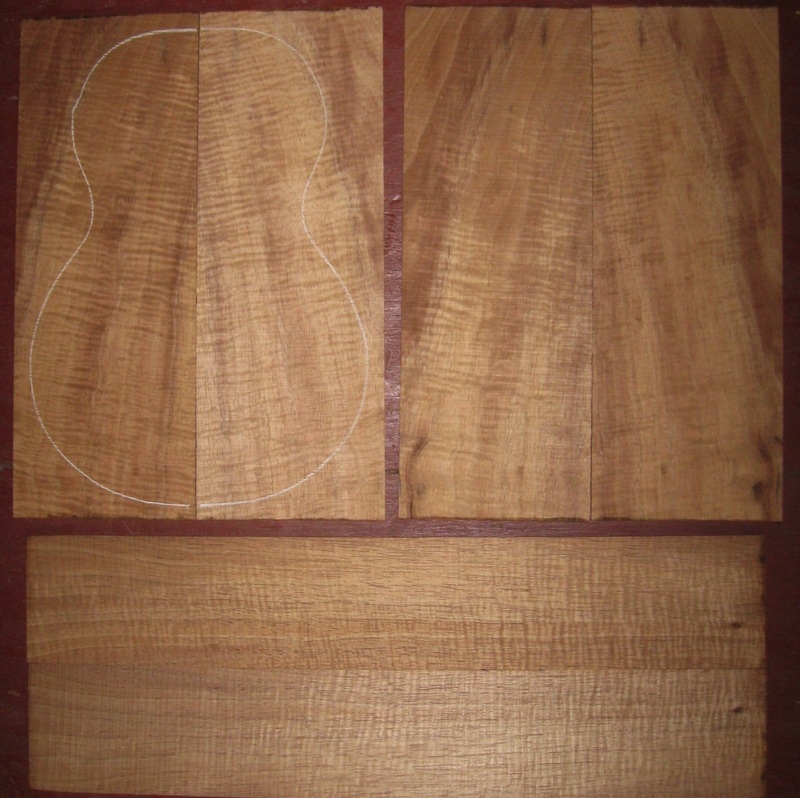 Add a high-grade Sitka spruce or Alaska yellow cedar soundboard for $12. 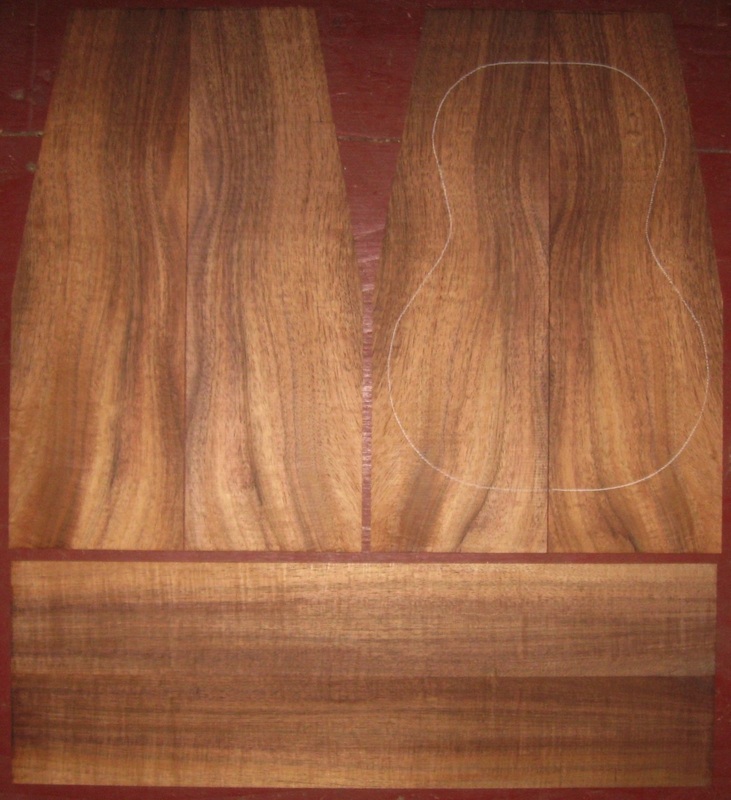 (4) top-back plates 5-1/2" x 17"
(2) side plates 3-1/2" x 22"
Air dried since 2006, straight grain, rich color, light-med figure. 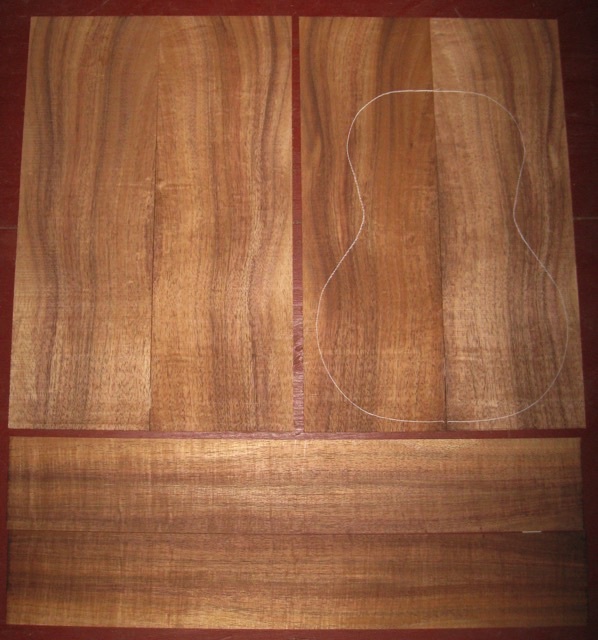 Handsome set. 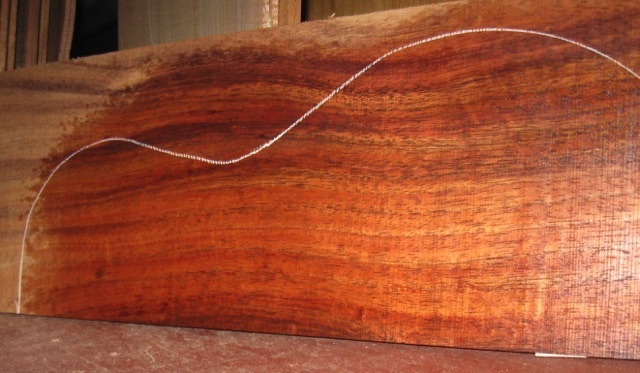 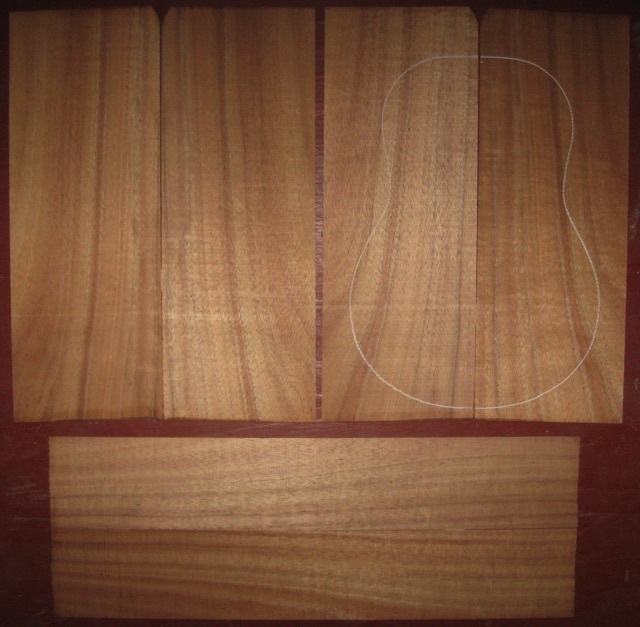 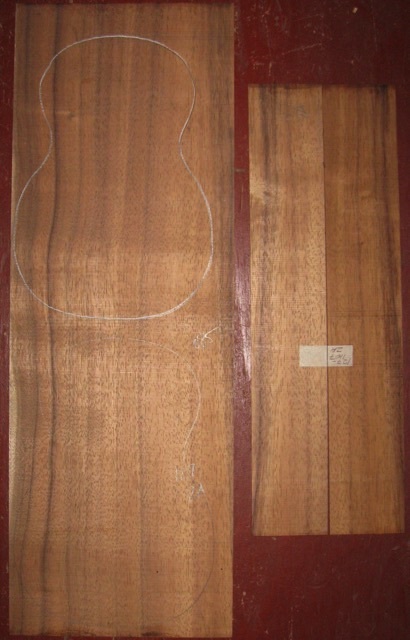 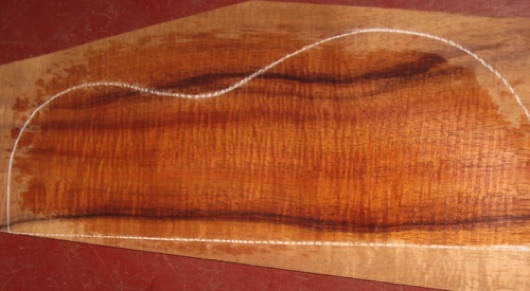 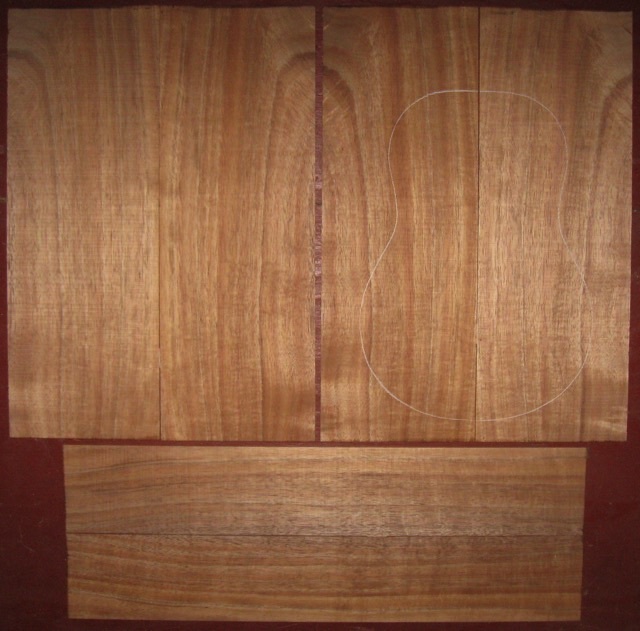 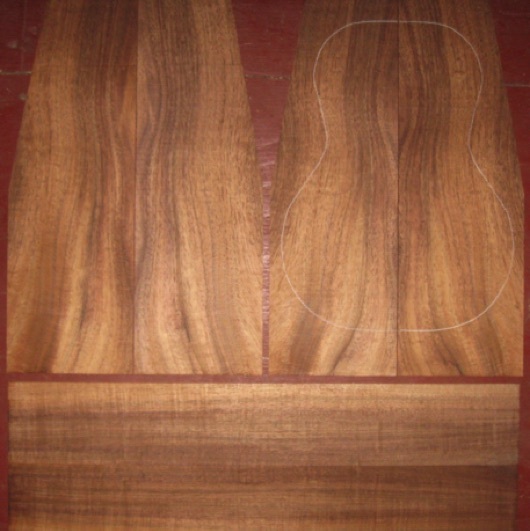 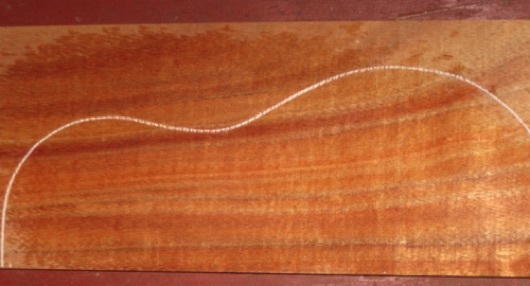 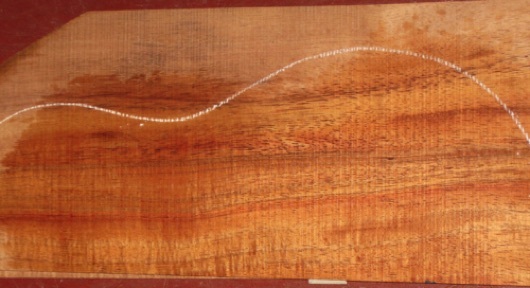 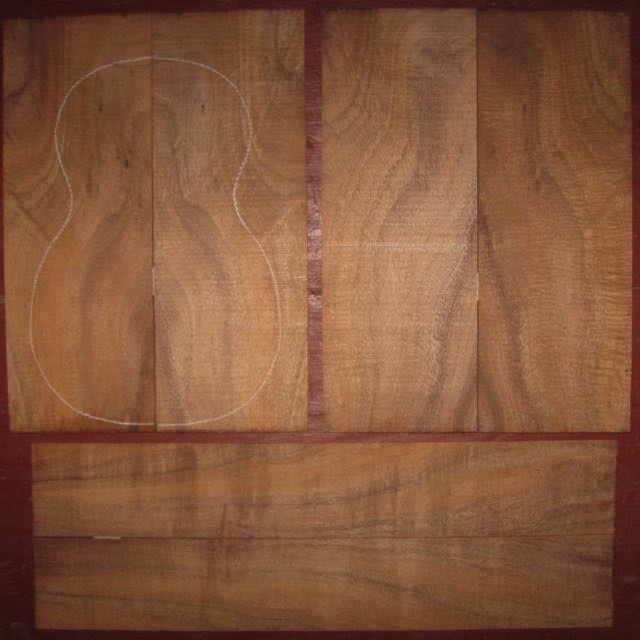 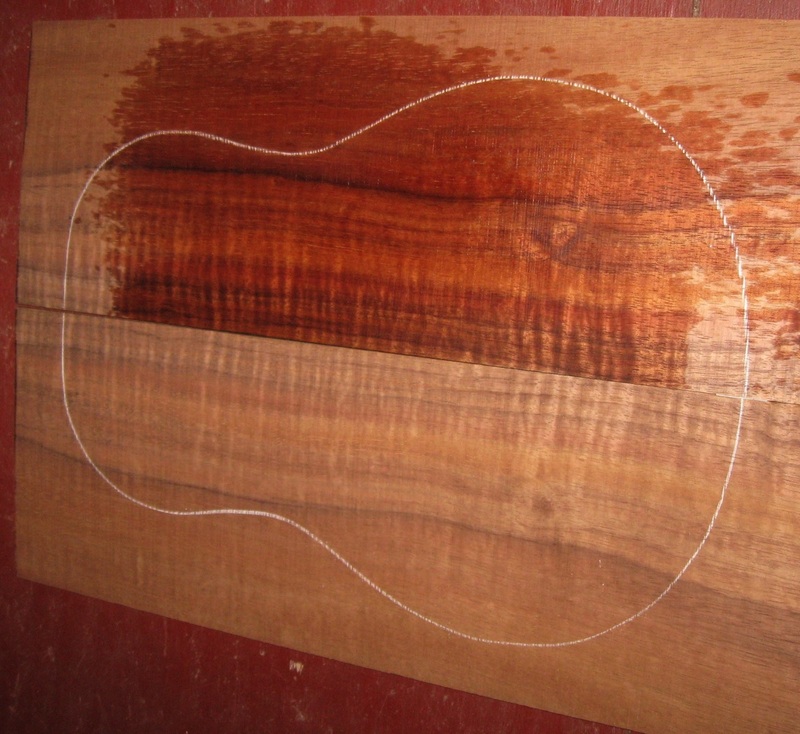 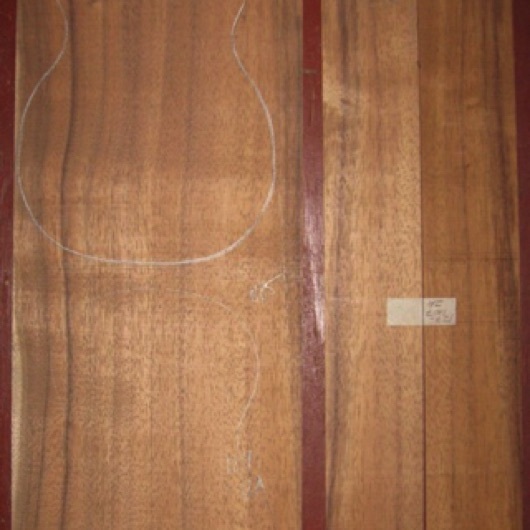 (4) top-back plates 5-1/2" x 16"
(2) side plates 3-1/4" x 19-1/2"
Air dried since 2016, tenor pattern shown, bright koa w/tight curl, straight, vertical grain. Air dried since 2006, baritone pattern shown, medium figure, lots of color variation. (4) top-back plates 4-3/8" x 12"
(2) side plates 3" x 17"
color; strong, tight fiddleback curl. 2 minor flaws: Tight knot on sides 3/4" from end (at right in photo). 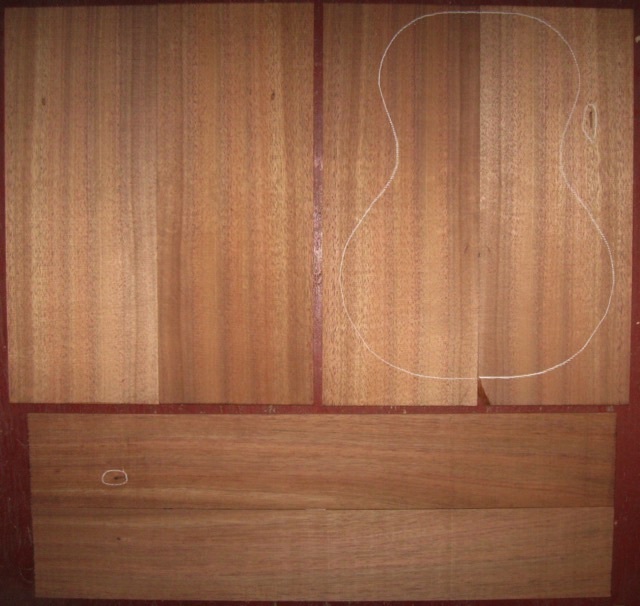 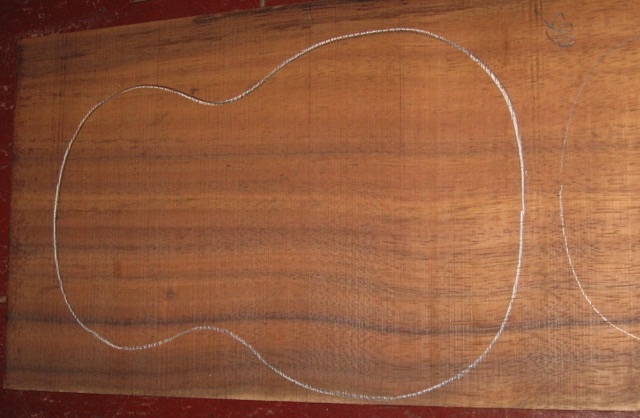 Also shallow inclusion inside of one top plate, not apparent on show face (can be located under fretboard). 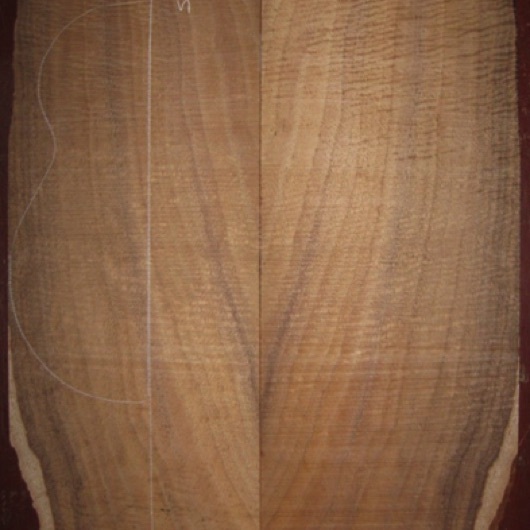 (2) top-back plates 4-3/4" x 28-1/4"
Air dried since 2010, gorgeous rich color; strong curl. (4) top-back plates 5-1/2" x 15-1/4"
Air dried since 2005, gorgeous color; strong, tight fiddleback curl. 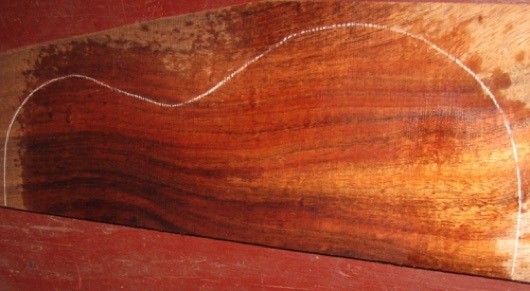 Top-back plates taper to 3" width. 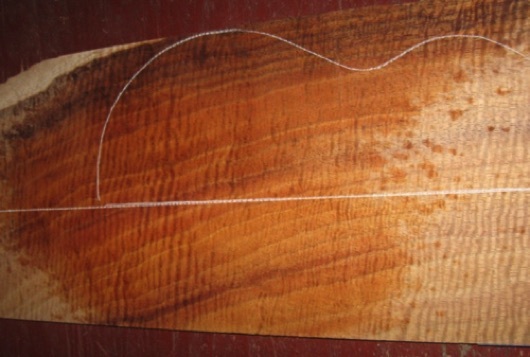 Curl especially strong on top and back bookmatches.